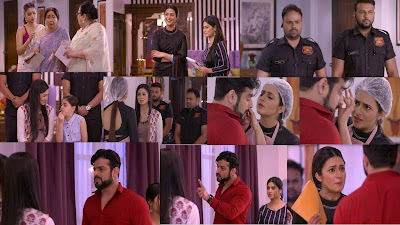 Home Yeh Hai Mohabbatein Yeh Hai Mohabbatein 29th June 2018 Episode Written Update "Raman Gives Ishita Custody Papers"
Yeh Hai Mohabbatein 29th June 2018 Episode Written Update "Raman Gives Ishita Custody Papers"
Episode starts with Mrs. Bhalla and Mrs. Iyer compete and make the delicacies for Aaliya’s catering order. Ishita gets happy seeing their fights. She recollects the old time and directs them for the betterment. She asks them to not make extra dishes and just help Aaliya as she tells them. She makes the planning and tells them that they can finish the catering order on time. Parmeet tells Simmi that this isn’t good that the family is uniting again because of Ishita. Simmi wishes Ishita gets away from them forever. Simmi gets angry on seeing Ishita bonding with everyone. He tells her that Ishita will always be Raman’s priority. He asks her to talk to Raman. She is sure that Raman won’t listen to her. Ruhi asks Raman if he wants to go home and meet Ishita. Raman also gets interested to go home. Ishita supervises the party order completion. Simmi gets angry seeing everyone smiling and happy. Raman gets bodyguards home for Roshni’s safety and tells the family that its really necessary to keep Roshni under vigilance. Roshni gets troubled by the guards’ presence all the time. She feels caged. She tells Ishita that she wants to feel free. Ishita tells Raman that Roshni won’t be feeling free if the guards are accompanying her all the time. Raman and Ishita fulfill Aaliya’s order on time. They deliver the food and get a good review. Aaliya’s first order gets successful. The family celebrates Aaliya’s success. Raman then brings a shocking thing. He reveals to Ishita that he has filed a custody case for Adi’s child. Ishita doesn’t want Roshni to stay in Bhalla house. Ishita gets a big shock on seeing the legal notice for custody case. Roshni gets stressed by their fights. Ishita scolds Raman for planning everything secretly. He tells her that he knew she will take Roshni with her, so she has found this way to get the child. She asks him if he has no concern for Roshni. She doesn’t want to leave Roshni with Bhallas as the kidnapper isn’t caught till now. Raman asks her not to tell him about the risk, as Roshni got kidnapped from her house before. Ishita gets adamant and feels she has done a mistake to get Roshni to them. She scolds the Bhallas for being so selfish and dragging them to the court. She tells them that Raman broke her trust. Raman tells her that she has also broken his trust by killing Adi. They get into a heated argument, which upsets the family. Roshni gets disheartened and feels guilty seeing the things getting worse. Ishita stands strong against Raman. Simmi tells Ishita that Raman has made plans to send Roshni abroad. Ishita asks Ruhi to tell her if this is true. Ruhi confirms the matter, which makes Ishita angry.